NFL owners: Let’s abolish the grotesque practice of showing Jerry Jones, Robert Kraft, et al., during NFL broadcasts. Let’s abolish the grotesque practice of showing team owners during NFL broadcasts. 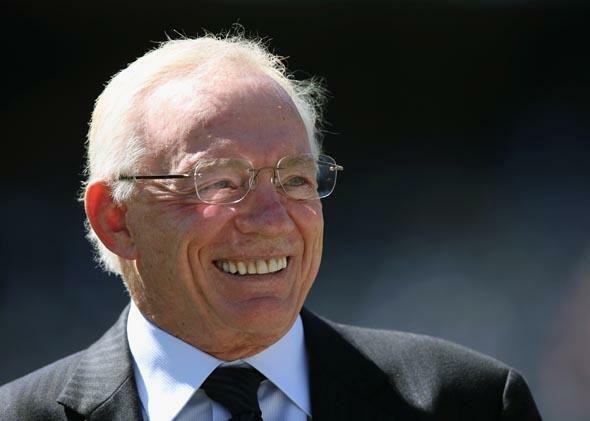 Jerry Jones owns the Dallas Cowboys. Can we all agree that we know this now, and don’t need to be reminded of it over and over? Late in the third quarter of October’s Broncos-Cowboys game, Peyton Manning underthrew Eric Decker on a midrange pass, leaving the ball hanging in the air for an easy interception. With 20 touchdowns and no picks to that point, Manning had seemed infallible, but now he had somehow faltered. While viewers waited to get another look, CBS cut from the Cowboys defensive backs celebrating, to Manning looking incredulous, back to the defensive backs, and then to—ugh—Cowboys owner Jerry Jones, pumping his fists. Could there be a more banal conclusion to this incredible turn of events? Why do we have to see the man who cuts the checks whenever something exciting happens on the field? The TV networks show Jones more than most owners. He’s made a name for himself by being awful, and broadcasters think this means we want to see him constantly. He’s also the team’s general manager, meaning he could potentially cut a guy right after the game if he missed a key tackle. So he’s important, but that doesn’t make him interesting; you certainly didn’t need to see him six times during that Dallas-Denver contest. NFL.com even put him in the highlight package. And it’s not just the Cowboys honcho who gets a lot of screen time. Robert Kraft, Jeffrey Lurie, Arthur Blank, Jim Irsay—if you’re a football fan, you know their names and faces. And that’s a shame. No one needs another boss in his life, nor another intrusion of the market. It’s bad enough that sports are cluttered up with a relentless accretion of commercials and logos, but at least there’s a clear purpose behind those things. Shots of the owners don’t contribute to anyone’s bank account. So why am I watching some suit in a luxury box gently fist-bump some other suit before looking up at a screen so he can catch himself in seven-second-delayed action? There is no one in that stadium whose reaction I am less interested in seeing. Or at least no one outside of that booth because, oh God, I’m pretty sure that’s Rush Limbaugh sitting next to Bob Kraft. Show me any player, any assistant strength coach, any sideline neurologist. Much better, show me any fan, somebody who made the dubious decision to fork over a lot of cash to be in the stands and is now being rewarded with his team’s success and feeling giddy over it. Just as good: showing that same fan as his team makes a mockery of his faith. The fact that Jones and company are wearing suits at a football game tells us they aren’t part of our community. When I jump off my couch in excitement at home, it is for a completely selfless and silly reason: The Bears just did good, and this is important to me because of an unthinking commitment I made to them decades ago. The average fan has invested only time and sympathy. Well, perhaps he has money riding on it, but even that’s not the same sort of financial relationship as an owner, since owners don’t really have much at stake with these games. If they didn’t inherit the team, they entered the fray as rich men looking for a rich hobby. Seeing them celebrate is like watching someone gloat over their fantasy team. Yes, it’s that bad. That touchdown is a private benefit and yet not a particular one. These just happen to be the players they were able to acquire. They might well own different ones another season. It’s even worse when the announcers feel compelled to glorify them. After CBS showed a Kraft high-five and then a replay of that high-five during a Patriots game earlier this year, John Lynch delivered a version of the speech you hear about Kraft pretty much every week: “I gotta tell ya, this is one of the class people in football, and there’s an old saying: It starts at the top. And I truly believe that, here in New England, it’s not a coincidence that their success has really taken off since Robert Kraft and the Kraft family have taken it over. Tremendous business minds that know how to win. They’re great for the community and great people, on top of it.” That’s a good piece of fawnin’ right there! Since the financial crisis, there’s been an influx of TV shows that function as ruling-class PR, stuff like Undercover Boss, Secret Millionaire, and Shark Tank. Are these shots part of that trend? Possibly, but they certainly predate the crash, as does a tradition of power-worshipping entertainment that gave us junk like The Apprentice and Meet the Press. As Matt Taibbi has written, our country has a strange love affair with arrogant executives, a tendency to believe that the richest person is the best person, that any problem can be solved by a benevolent autocrat. These aren’t just rich guys, we’re told. They’re great guys. Earlier this year, when Dallas was playing against Washington, NBC’s Al Michaels and Cris Collinsworth sang Jerry Jones’ praises for not cutting back costs on his (partially publicly funded) stadium after the financial crisis. In the same game, they lauded him for not riding Tony Romo for the pick he threw at the end of that Broncos game. “Jerry can take the heat off as well as anybody I’ve ever seen,” Michaels said, describing a guy who has complained to the media about players for things like being injured. CBS announcer Jim Nantz, ever grooming himself to become the NFL’s Minister of Information, took a moment during that Broncos-Cowboys game to praise Jones for being the first ever inductee into the National Football Foundation Leadership Hall of Fame. This happened at a “spectacular fundraiser” event, Nantz explained. Now, charity is charity, so you have to give Jones his due for raising money for an important cause like … “Football Matters to Me”? Yes. Its mission is “to identify the men who played college football and subsequently went on to amazing accomplishments with football as a key catalyst to their achievements. The goal of the campaign is to generate a strong understanding of how the values learned through football translate to success later in life.” NBC’s Michaels was there, along with some retired football players, GE’s Jeff Immelt, and oilman T. Boone Pickens. Football matters to them. More importantly, they matter to football, and to the rest of us. But we don’t need this organization to tell us that great businessmen give us great football and vice versa; we’re given that message during every football game on every network. Though you won’t hear it discussed on Sundays, NFL owners aren’t necessarily superior beings. They played a role in the league-wide concussion cover-up, and there are plenty of alleged individual misdeeds to discuss as well. Browns owner Jimmy Haslam is under investigation for allegedly defrauding customers at his chain of truck stops. Vikings owner Zygi Wilf was recently found guilty of racketeering. Neither story came up during this year’s Browns-Vikings game. Good-guy owners like Kraft, too, benefit from these sins of omission, as when Fox’s Kevin Burkhardt claimed earlier this season that the New England owner saved the franchise from moving (true) while failing to mention that he very nearly moved the team out of Massachusetts himself. I’m not saying we all have to hate NFL owners. I’m just asking not to have to see them. It’s especially annoying that the incidence of owner shots increases as the game gets most exciting. Hence NBC gave us three images of Jones in the final 90 seconds of a Week 1 game. There’s a clear narrative here: Is the boss happy? The shots multiply in the postseason, making the game ever more about ROI. Indeed, postseason success, not virtue, is what separates those the camera loves from those it just sneaks a peek at now and then. As much commercialism as there is in sports, it is still possible in the moment to watch an interception and delight in the way the defenders instantly turn to find a man to block and begin a frantic rush to the end zone, and see only that, and not think of the depressing array of dynamically synergistic cash flows involved in bringing that play to your living room. Shifting from this intricate dance to an owner’s dull reaction makes for bad, simplistic TV. The players in a sporting event are confined by the dual limitations of the rules and their bodies, against which they struggle using their wits and their wills. When such an event culminates in a money shot, it reduces a beautifully coordinated spectacle of strength, grace, and chemistry to a crass display of power. It cheapens the whole endeavor. Leave the bosses to their business. Let the game express itself.